Visit our blog to read about Michelle Barry's adventures in cooking and eating Irish cuisine and to learn about new products and upcoming events. So it turns out having four kids five and under is busy. It doesn’t really “feel” busier than three, but it must be. See, I notice it more in the things that don’t get done because I have more priorities to sift through and more goes by the wayside. So while I’ve been managing to get home-cooked meals on the table most nights, taking photos of them, writing down recipes, even trying new recipes has mostly not happened. Evenings are chaotic. It all is. But it’s also fun. And hard to believe how much the kids have grown up in a few short years. They are able to offer more and more help in the kitchen and everywhere. I’ve also noticed a gradual change in their eating habits. Isla eats a lot these days and Eve has been surprising us by eating all kinds of stuff she never did before, broccoli, mushrooms, celery, etc. Noelle likes everything and Emmett, always a good eater, gets a little better each week. I’m looking forward to the day when they all eat less like toddlers and I’m hopeful that it might be somewhat soon. One food we all like is this cake. Well, in the end at least. Emmett swore he wasn’t going to like it before he even tried it because it wasn’t chocolate (he made me promise that he could have candy for dessert instead - ever the negotiator). Of course, he ended up being obsessed and claiming all of the leftovers for himself. I wonder what his kindergarten teacher thought of me sending him to school with a slice of cake in his backpack. “Mother of the year?” “She must be French?” Hopefully the latter. Either way, I’m so glad I remembered my little trick of making an extra to stash in the freezer. I made this simple Almond and Pear Cake for Paddy’s birthday this year. It’s really an almond cake with some sliced pears on the bottom - the top when flipped over. It doesn’t taste strongly of pear but is definitely almondy if you like that sort of thing. I’m a sucker for anything with almond paste. It’s also one of those cakes that gets even better if you let it sit for a day. Which is great if you are having a dinner party and have other dishes to focus on. We also had rack of lamb, green beans with almonds and brown butter and potatoes, though by the time we sat down to eat, food was the last thing on our minds. That’s because Paddy had gone to church that evening for some kind of event and was supposed to get to our house around 5pm, according to Paul. When 6pm rolled around and he was nowhere in sight, Paul got worried and started to drive around looking for him. Meanwhile, I was grilling my brother-in-law John about where he could be, whether or not he had a cell phone with him, where the church was, when the meeting was - all questions he couldn’t answer. Paul did know what church it was and had already called. They told him that the meeting ended an hour earlier which only worried him more, so he set off for the church. A little while later, Paddy waltzed through the door without a care in the world, talking about how the meeting had run quite long. Classic! Relieved, we all felt silly for being so worried, after all, Paddy has been navigating the world for several decades, most of them before cell phones and gps. The funny thing is, this kind of thing happens ALL THE TIME with the Barry boys. I’m so glad Paul’s sister CeCe has moved back to Chicago to commiserate with me and help keep everyone in line. The benefit of this little scare was that I think it made us all a little more grateful for another year of happiness and good health with Paddy. We love him so much! Even more than cake. Preheat the oven to 325F. Line two six-inch (or one 8 or 9 -inch) cake pans with parchment paper and spray with cooking spray. Peel and slice the pears. Arrange them in the bottom of the cake pan. Whisk together 3/4 cup of cake flour, the baking powder, and the salt. Set aside. In a food processor, grind the sugar, almond paste, and 1/4 cup of the cake flour until the almond paste has mixed with the sugar and forms a sandy texture. With the food processor running, add the cubes of butter one at a time, followed by the almond extract. Process until the batter is smooth and light. Add the eggs one at a time, processing after each addition. Add half of the dry ingredients and pulse until incorporated. Then add the rest of the dry ingredients pulsing a few times again until just incorporated. Pour the batter over the pears, then bake the cake in the center of the oven. Check it after 40 minutes rotating in the oven. Watch it closely, mine took 55 minutes but it can take as long as 70 minutes depending on the pans you use, your oven etc. When a toothpick inserted in the center comes out clean, remove the cake from the oven and run a sharp knife around the perimeter of the pan to loosen it from the sides. Let the cake cool completely, then invert it. Wrap in plastic and keep at room temperature until you are ready to serve. 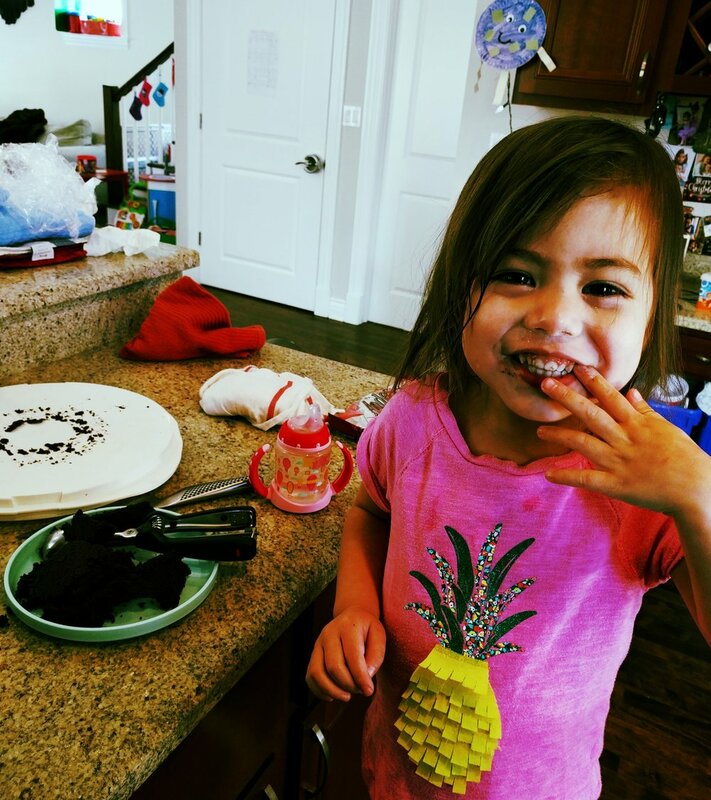 The little ones have yet to understand how much time it takes to say, bake a cake. They think that it if they will cake to appear, it will. For the longest time they would ask me to bake them something for dessert on weeknights, when there was barely enough time left for a book before bedtime, let alone homemade dessert. Besides, we really shouldn’t be eating dessert on weeknights anyway should we? Though I sometimes secretly wish it was the 60’s and we ate homemade desserts every night. Who would make them? Not me. I finally put a stop to all of the asking by instituting the “Homemade Dessert Night” on the weekend. I started to suggest to them that we pick out a homemade dessert to make on either Saturday or Sunday when we have the time for such a project. This has helped to teach them that desserts, like most things in life, do not materialize out of thin air and has become a fun activity that we all look forward to. We start by selecting a baking book and then a recipe to try. Then we assemble all of the ingredients we need and measure them out so that when it’s time to do the baking, it’s a relatively simple affair. And, when things go well, not too messy. A couple of weeks ago we made Rachel Allen’s molten lava cakes from her awesome book “Bake” which were such a resounding success that, well, the lack of photographic evidence speaks for itself. Then last weekend we made Nigella Lawson’s Dense Chocolate Loaf Cake which you can find the recipe for here. I halved the recipe and again, the cake didn’t last long enough to get any “after” photos. In fact, only a tiny sliver was left to share with family the next day. The baked cake itself was no beauty. Due to its super moist batter, it sinks quite a bit in the middle, but it’s oh so delicious - the perfect cake for “Homemade Dessert Night”. Easy, simple and impossible to mess up, especially since it’s not meant to be pretty anyway. Any amount of time when you are waiting for a homemade dessert to come out of the oven is a long time. When you’re talking about he five and under set, any amount of time is a long time. Period. So it’s not easy. But, when it’s all said and done, it is gratifying to make something delicious from scratch. Try it, I promise it's worth the wait! Several years ago, my brother’s girlfriend Jenn gave me a decorative bundt pan for Christmas. I love it. While it may not be the first thing you think of to give someone as a gift, if you know someone who bakes, it really is the perfect present. Each year I use it at least once, usually for Christmas cake, and I always think of Jenn. Now that my brother and Jenn live in the Caribbean and we don’t see them as much as we would like, it’s nice to have them at our table, at least in spirit (or bundt, as it were). This year, after falling in love with cream cheese whipped cream at Thanksgiving, I adapted the same recipe to create a peppermint whipped filling for my Christmas cake. This was super simple, I used the exact same recipe as the topping for our Thanksgiving pie (recipe here) except I used peppermint extract instead of vanilla and folded in about a cup of andes peppermint chips at the end. I used this to fill and decorate my Chocolate Fudge Bundt Cake that I made by following this King Arthur Flour recipe almost exactly, only subbing half of the white sugar for brown and the vanilla extract called for with peppermint. I didn’t make the ganache topping that the recipe includes, but if I had it to do over again, I think I might actualy make the ganache. I thought that might be too much but in retrospect, why not? Go big or go home. Alas, this cake was big as is and quite popular (especially with the kids, well, only after I told them that the andes peppermint chips were m&m’s - oh the lies I tell these days). The final cake was super moist, chocolate and pepperminty. Kind of like a starbucks peppermint mocha in cake form. Yes please. One of the great things about this cake is that you can, and should, bake it the day before because it is even better the next day. I baked it the morning before and left it in a covered cake carrier on the counter overnight. Then on Christmas morning, after all of the presents were opened, I made the filling, decorated the cake and slipped it into the fridge until it was time for dessert. This one helped, and by “helped” I mean, helped eat the cake that I cut out to make room for the filling. The filling part is pretty intuitive. After you have successfully released your cake from the pan, let it cool completely. While it is cooling, wash the pan, dry it thoroughly and put the cake back in. 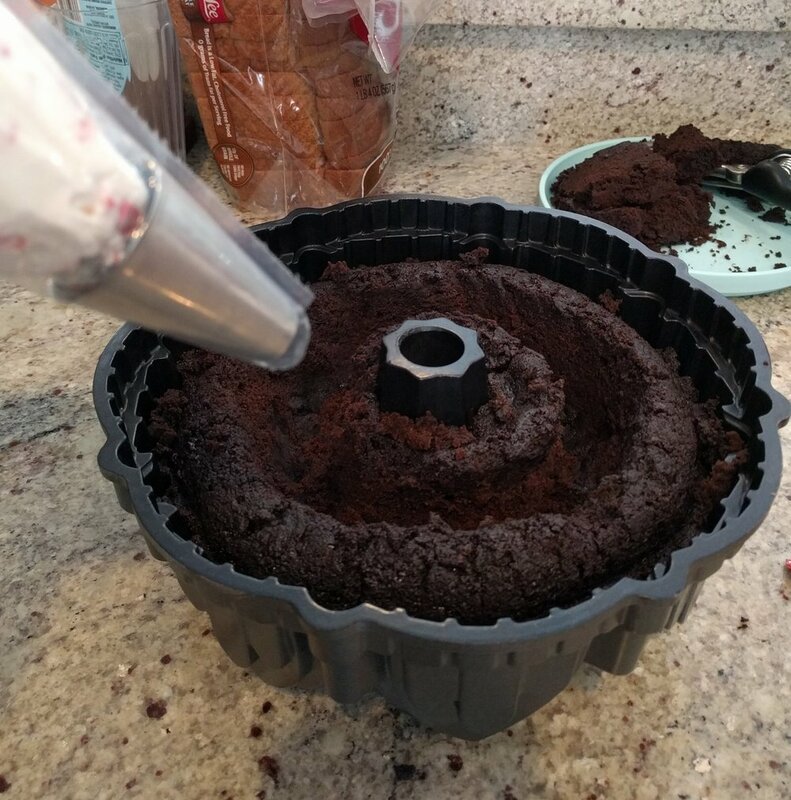 When you are ready to fill it, dig a moat out of the center of your cake - be careful! Don't dig too deep, you don't want to break the cake. If you want, thought it's not necessary, you can cover the filling with some of the cake pieces you took out. I used the remaining filling to pipe a border around the cake and decorate - this was primarily to prevent myself from eating too much of the peppermint cream (I could eat it by the cupful with a spoon. I could never be a skinny pastry chef). Powdered sugar is all it needs (though, like I said, I wouldn't turn my nose up at some ganache). 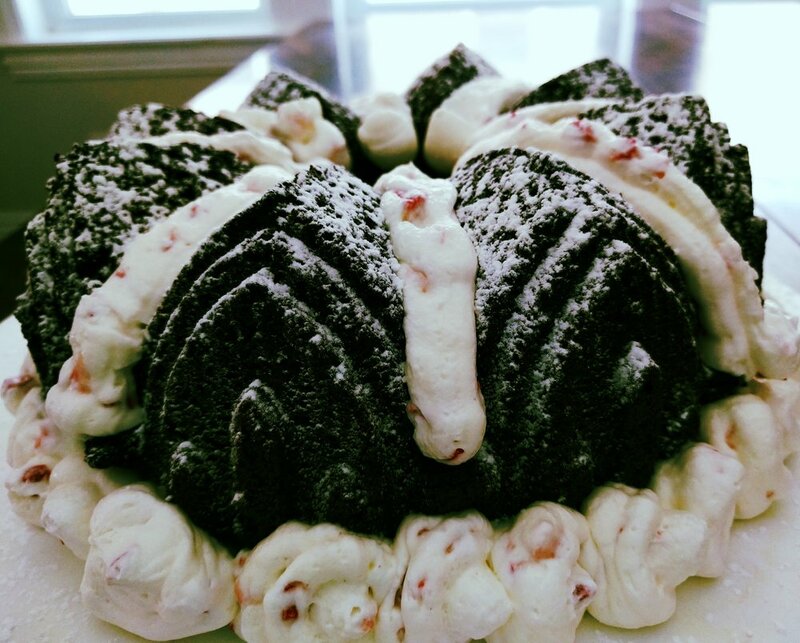 The day before Christmas, after baking the bundt and turning it out to cool, we headed off the Long Grove. 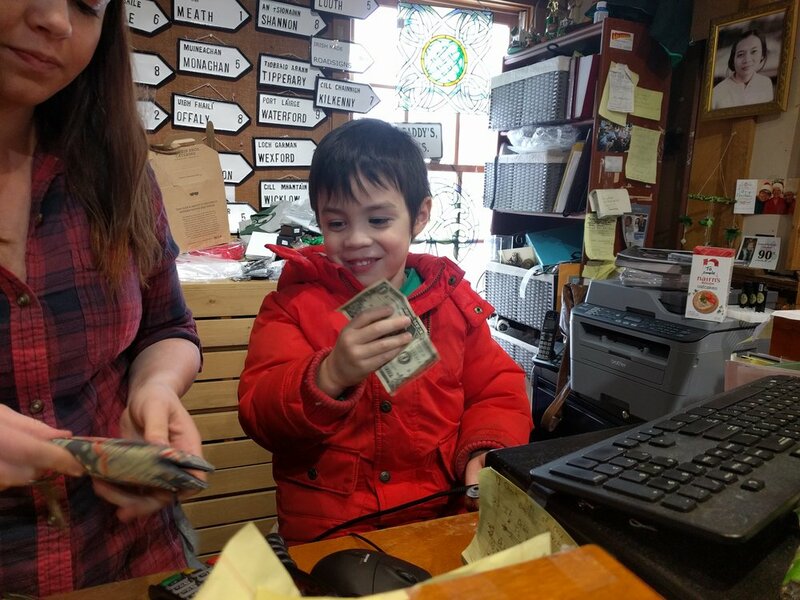 Emmett enjoyed working the cash register, Isla wanted to play with leprechauns and Eve was all about the vast array of Irish snacks now available at Paddy's on the Square (Noelle slept through all the fun). If you haven't been in for a while, come check out the selection. I ended up bringing a few items home to try which I plan to write about here in the next couple of months. Putting them to work early! Soda bread, brown bread, potato farls, sausage rolls, Winston's sausages, meat pies, black and white puddings, Irish bacon and more. 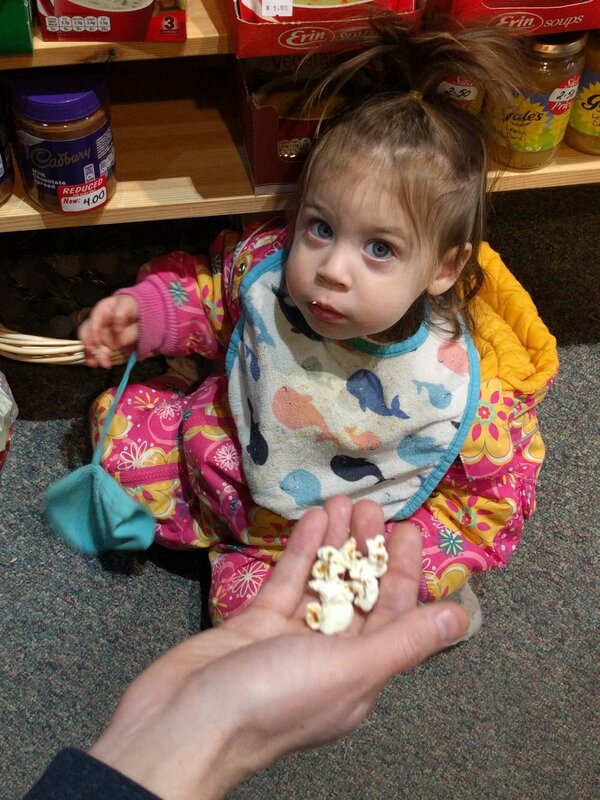 Sampling all of the snacks. Hot and spicy Monster Munch was her favorite. Something for everyone. I always gravitate towards the baking mixes, flours and condiments. Paul went for the curried baked beans and Shepherd's pie mix. The kids, of course, want ALL the snacks and candy. Thanks for visiting and Happy New Year!